I'm in love with a jumpsuit. I said it. I discovered it in a random shop in Derby and crazily decided not to buy it the first time I saw it. Realising I'd been a fool, rather sadly, I went back the next day to try it on (what a weak being I am). It fitted like a dream. Now, I've never owned a jumpsuit, so I was admittedly a bit apprehensive about wearing it. But it's ridiculously easy to style and comfy to wear. Perfect-a-mondo. What do you guys make of it? You can get 20% off until Sunday at Glamorous.com with code AUGBANK20. Onto the shoes. I had to sell the pair of Topshop Arabels I originally bought as my strangely shaped feet were completely mushed in them. Luck was on my side though, as the exact same boots in the next size up appeared on next2nowt.com. As you guys can probably tell, this is my absolute faaaavourite website at the mo! They fit perfectly now and I can walk without my feet being crushed to a boney pulp - wahoo! 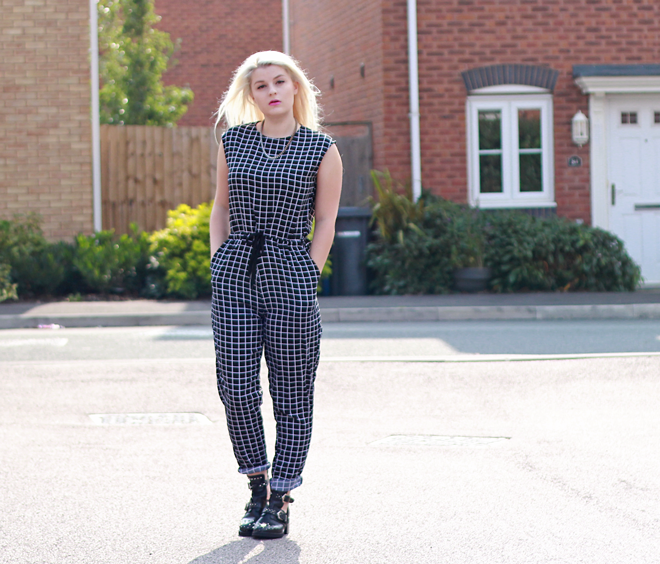 Full on love this jumpsuit! I don't think I've ever even tried one on yet (I love playsuits but I wasn't too sure on going full-length at first!) but I love the pattern on this one and it looks so good on you you may have convinced me to try one on next time I see one in store! Oh this outfit is amazing Robyn, love that jumpsuit! this outfit is so perfect, you look stunning! I love how this jumpsuit looks with your cut out boots! My god that jumpsuit is amazing!! I wish I could pull it off!! I need this jumpsuit, you look really nice in this! nice post and images. i like your style. thanks for sharing.